Kenneth Owen Morgan, Baron Morgan, FRHistS FBA FLSW (born 16 May 1934) is a Welsh historian and author, known especially for his writings on modern British history and politics and on Welsh history. He is a regular reviewer and broadcaster on radio and television. He has been an influential intellectual resource in the Labour Party. He grew up in rural Wales and attended Aberdovey Council School in rural Wales, University College School in Hampstead (in London), and Oriel College, Oxford. The first two appealed to him. As for Oxford he recalled, "The disagreeable nature of the undergraduates was matched by the mediocrity of the tutors. They were astonishingly poor.... All in all, Oriel seemed more like a backwoods seminary of mid-Victorian days than a modern educational institution." He had better luck outside his insular college. "On the intellectual side, I attended a variety of lectures which seemed to me brilliant and what I really needed in Oxford, by people like Asa Briggs, Christopher Hill, Hugh Trevor-Roper, and the incomparable and deeply entertaining Alan Taylor." He returned to Oxford for doctoral work, specializing in the role of Wales in British politics in the late 19th century, with a focus on Gladstone. He greatly enjoyed graduate work, taking his DPhil in 1958. He taught at University of Wales Swansea from 1958 to 1966 and held an ACLS Fellowship at Columbia University, New York in 1962 -63, also teaching there in 1965. He was a Fellow of Queen's College, Oxford, from 1966 to 1989 and served as Vice-Chancellor of the University of Wales from 1989 to 1995. In this capacity, he served as a Welsh Supernumerary Fellow of Jesus College, Oxford from 1991 to 1992. He was principal of the University of Wales, Aberystwyth in the 1990s. In 1983 he was elected Fellow of the British Academy and in 1992 he was made an Honorary Fellow of Queen's College, Oxford, and in 2002 of Oriel College. He became a Druid of the Gorsedd of Bards in 2008 and in 2009 received the gold medal from the Honourable Society of Cymmrodorion for lifetime achievement. He is also a Founding Fellow of the Learned Society of Wales. Morgan is a member of the Labour Party, and on 12 June 2000 he was made a life peer as Baron Morgan, of Aberdyfi in the County of Gwynedd. He has served on the Lords Select Committee on the Constitution. He was married to the historian and criminologist Jane Morgan, who died in 1992; they had two children together, David and Katherine. In 2009 he married Elizabeth Gibson, senior lecturer in law at the universities of Tours and Bordeaux. They have four grandchildren. Kenneth Morgan is the author of many acclaimed works, such as The People's Peace, his notable history of postwar Britain, and has completed biographies of many famous politicians, including David Lloyd George, Keir Hardie, James Callaghan, and Michael Foot. He is the editor of the best-selling The Oxford Illustrated History of Britain, to which he contributed the two final chapters (1914–2000 and 2000–10), and which has sold close on a million copies. He also edited the Welsh History Review from 1961 to 2003. Wales in British Politics, 1868–1922, dealt with the enlarged franchise, the campaign for disestablishment, Home Rule legislation (mainly with regard to Ireland) and contrasting attitudes to an imminent World War. Freedom or Sacrilege dealt with contrasting stances on the issue of Welsh church disestablishment but where he came down in favour of the freedom obtained under the latter. the ferocity of argument owed more to current politics, the unions’ winter of discontent [in 1979], and rise of a hard-left militant tendency within the world of academic history as well as within the Labour Party. The new history was often strongly Marxist, which fed through the work of brilliant evangelists like Raphael Samuel into the New Left Review, a famous journal like Past and Present, the Society of Labour History and the work of a large number of younger scholars engaged in the field. Non-scholars like Tony Benn joined in. The new influence of Marxism upon Labour studies came to affect the study of history as a whole. In many ways, this was highly beneficial: it encouraged the study of the dynamics of social history rather than a narrow formal institutional view of labour and the history of the Labour Party; it sought to place the experience of working people within a wider technical and ideological context; it encouraged a more adventurous range of sources, ‘history from below’ so-called, and rescued them from what Thompson memorably called the ‘condescension of posterity’; it brought the idea of class centre-stage in the treatment of working-class history, where I had always felt it belonged; it shed new light on the poor and dispossessed for whom the source materials were far more scrappy than those for the bourgeoisie, and made original use of popular evidence like oral history, not much used before. But the Marxist – or sometimes Trotskyist – emphasis in Labour studies was too often doctrinaire and intolerant of non-Marxist dissent–it was also too often plain wrong, distorting the evidence within a narrow doctrinaire framework. I felt it incumbent upon me to help rescue it. But this was not always fun. I recall addressing a history meeting in Cardiff...when, for the only time in my life, I was subjected to an incoherent series of attacks of a highly personal kind, playing the man not the ball, focusing on my accent, my being at Oxford and the supposedly reactionary tendencies of my empiricist colleagues. ^ "No. 55876". The London Gazette. 15 June 2000. p. 6507. ^ "Kenneth O. Morgan". King's College London. Retrieved 23 March 2014. ^ Kenneth O. Morgan, My Histories (University of Wales Press, 2015) p 85. ^ a b Morgan, My Histories (2015) p 86. 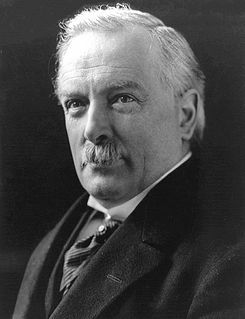 David Lloyd George, 1st Earl Lloyd-George of Dwyfor, was a British statesman and Liberal Party politician. He was the final Liberal to serve as Prime Minister of the United Kingdom. Jesus College is one of the constituent colleges of the University of Oxford in England. It is in the centre of the city, on a site between Turl Street, Ship Street, Cornmarket Street and Market Street. The college was founded by Elizabeth I on 27 June 1571 for the education of clergy, though students now study a broad range of secular subjects. A major driving force behind the establishment of the college was Hugh Price, a churchman from Brecon in Wales. The oldest buildings, in the first quadrangle, date from the 16th and early 17th centuries; a second quadrangle was added between about 1640 and about 1713, and a third quadrangle was built in about 1906. Further accommodation was built on the main site to mark the 400th anniversary of the college, in 1971, and student flats have been constructed at sites in north and east Oxford. David Alfred Thomas, 1st Viscount Rhondda, PC was a Welsh industrialist and Liberal politician. He was UK Member of Parliament (MP) for Merthyr Tydfil from 1888 until the January 1910 general election, then MP for Cardiff until the December 1910 general election, when he left politics to concentrate on his business interests. He was made a member of the Privy Council in 1916. He later held office, notably as "Food Controller" in Lloyd George's wartime coalition government. Gwilym Lloyd George, 1st Viscount Tenby, was a British politician and cabinet minister. A younger son of Prime Minister David Lloyd George, he served as Home Secretary from 1954 to 1957. Cledwyn Hughes, Baron Cledwyn of Penrhos, was a Welsh Labour politician, usually associated with the moderate wing of the party. He was also regarded, particularly in later years, as a non-political figure of stature in Wales having held posts of importance in bodies such as the University of Wales. Thomas Edward Ellis, often known as T. E. Ellis or Tom Ellis, was a Welsh politician who was the leader of Cymru Fydd, a movement aimed at gaining home rule for Wales. Ellis was, for a time, the most prominent of a generation of Liberal politicians who emerged in Wales after 1886, who placed greater emphasis than the previous generation to a Welsh dimension to their politics. His early death in 1899 in his fortieth year added to the aura that surrounded his name. William Llewelyn Williams known as Llewelyn Williams, was a Welsh journalist, lawyer and radical Liberal Party politician. William Abraham, universally known by his bardic name, Mabon, was a Welsh trade unionist and Liberal/Labour politician, and a member of parliament (MP) from 1885 to 1920. Although an MP for 35 years, it was as a trade unionist that Abraham is most well known. Initially a pioneer of trade unionism, who fought to enshrine the principle of workers' representation against the opposition of the coal-owners, he was regarded in later life as a moderate voice believing that disputes should be solved through conciliation rather than industrial action. This drew him into conflict with younger and more militant leaders from the 1890s onwards. However, although the defeat of the miners in the South Wales strike of 1898 was a clear defeat for Mabon's strategy, his prestige was sufficient to ensure that he became the first president of the South Wales Miners' Federation which was established in the wake of the dispute. Abraham was noted for his powerful speaking voice, and was a renowned orator in English and Welsh. Frank Hodges was an English trade union leader, who became General Secretary of the Miners' Federation of Great Britain. A Member of Parliament (MP) for one year, he was Civil Lord of the Admiralty in the first Labour Government. His Honour Sir Thomas Artemus Jones KC LLD, was a Welsh Judge, journalist, nationalist and Liberal Party politician who campaigned for the Welsh language. This is a bibliography of published works on the history of Wales. It includes published books, journals, and educational and academic history-related websites; it does not include self-published works, blogs or user-edited sites. Works may cover aspects of Welsh history inclusively or exclusively.